Erdbeertörtchen have good chances to win the award of gayest sounding band name ever, and I could imagine them sitting next to Ralf Morgenstern in his Kaffeeklatsch TV show. After the band name, I also was fascinated by the cover artwork which is a coloured pencil drawing showing a girl in a forest collecting mushrooms. The good ones are in her basket, but a bad one is hidden behind a tree. And in the background, you notice a bear leaving the forest. Only toilet paper in his hand is missing. More important however is the music. Erdbeertörtchen are playing instrumental melancholic indie or post rock inspired by bands like Tortoise or Mogwai. Especially the two guitars and the keyboards are trying to create a dreamy sound. 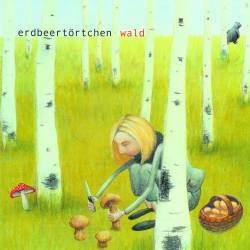 Erdbeertörtchen surely succeed in creating pretty nice songs, but the album is missing highlights. Too many songs are sounding identical. While listening to the album, I can't get rid of the impression that it is just background music for a movie. I respect that they are experiencing with instruments like violins, horns or piano, but instead of rocking, Erdbeertörtchen give too much weight to the emotional and harmonic side of the music. Noisy parts as on Cruebel are very rare. By the way, most song titles are very strange (Pflaumenjahr, Krokel, Magenfahrplan,...). This debut is nice, but nothing more. Indie pop fans may like it, but Erdbeertörtchen still need more experience and variation.